Investors are sceptical about global financials, not recognising their long-term potential. Since 2008, the Denker Global Financial Fund (previously known as the Sanlam Global Financial Fund) has generated a compound annual growth rate of 15.8%. In fact, the fund has won numerous international awards for exploiting opportunities in financials globally. Its most recent award, the Lipper Fund Best Fund of the Year Award received in March 2019, recognises the excellent returns generated by the fund in the financials sector (for the three years to the end of February). indicate how we find the best value for inclusion in the fund. Global financials have been de-rated despite consistently growing shareholder value. Return on capital (RoC) gives an indication of the yield required by a company’s management to generate returns on the capital that shareholders have entrusted to them. Price to book (PB) ratio indicates the price investors are prepared to pay for that yield. 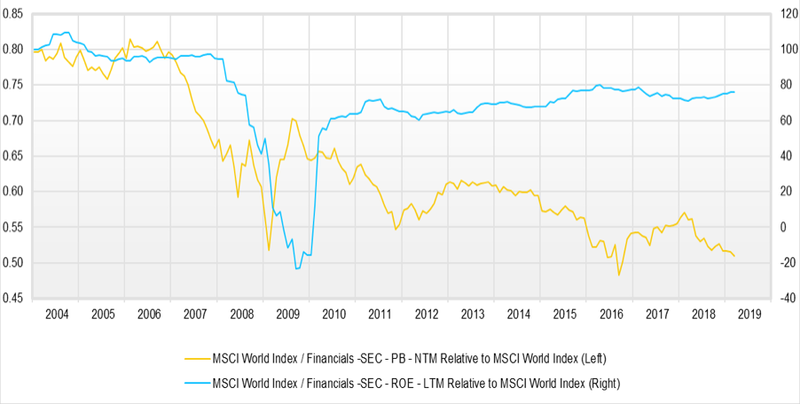 In the figure, I’ve shown the RoC and PB ratio relative to the MSCI World Index. It is evident that, even though global financials have gradually increased their RoC relative to the market since 2008, they were at the same time gradually de-rated relative to the rest of the market. Negative press is the key reason for the market’s mispricing of global financials. 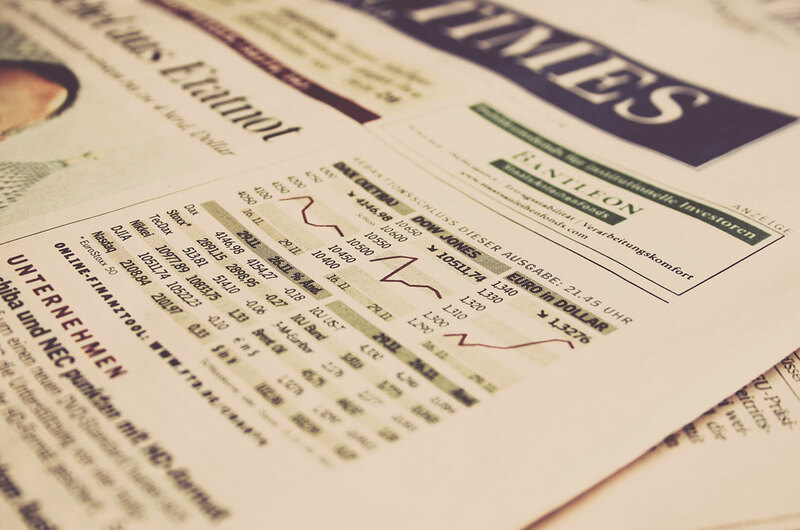 The press has been focusing on the sector’s troubles – such as accounting changes, increased scrutiny, higher regulatory burdens, lower growth and lower interest rates – while ignoring the fact that companies have successfully responded to these challenges. The adjustments have been made, good management teams have sold off or closed units with low profitability, and efficiency levels have improved (mainly through technology). Banks and insurers now have cleaner balance sheets and better reserves than they have had over the past 30 years. However, the negativity instilled by the media is preventing a rational appraisal of what the sector has already done and its potential future returns. Besides the negative emotional association with global financials, the complexity introduced by new accounting statements has created information asymmetry. As a result, most investors see this asset class as ‘too hard’ to assess for investment. Focused research reveals many attractive financial opportunities globally. are managed by capable, ethical management teams with a good track record of allocating capital wisely. This philosophy helps us find future winners that are currently mispriced due to the market misunderstanding their future earnings potential. These companies are not necessary well known – I would guess that only 5 of the top 15 investments in the fund are familiar to most investors. For example, companies like TCS, Essent, TBC Bank, and One Savings Bank (to name a few) are reporting excelllent results, but they remain mispriced. Our recipe for finding attractive global financial stocks continues to deliver results. They have a track record of generating growth on shareholder value. They generally operate in a supporting macro-political environment that will enable them to continue growing shareholder value. They are priced below their long-term average valuation. The combination of a tried-and-tested recipe, specialist expertise, and many years of experience gives us the confidence to take advantage of short-term market mispricings for investors. Find out more about the long-term opportunities available through the Denker Global Financial Fund. The Denker SCI Stable Fund: Good relative performance despite weak markets →← Moneyweb explains our approach and why we have competitive advantage.